Whether we deserve it, or not, European house sparrows seem to love us. While most birds seek only the seed and other things we intentionally offer, house sparrows choose to live as close to us as possible, benefiting from unintentional offerings around our homes and eateries. As their name suggests, the European house sparrow is not native to the U.S. During 1890 and 1891, some hundred birds were brought over and released in New York, to “comfort” human immigrants who missed having these spirited little birds around. Their numbers quickly skyrocketed as they spread across the continent, flourishing virtually everywhere they went. Eventually, people began looking for ways to get rid of sparrows, and we now have effective, non-lethal ways to prevent these birds from dwelling where they are not wanted. Let’s start closest to home—where house sparrows take a look at vents for stoves, dryers, bathrooms, and attics and apparently think, “Perfect nest site!” Ideally, you want to protect vents in advance of the nesting season. 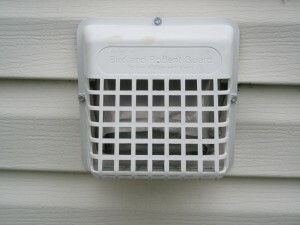 Commercial covers for dryer vents keep birds out and are removable for cleaning. 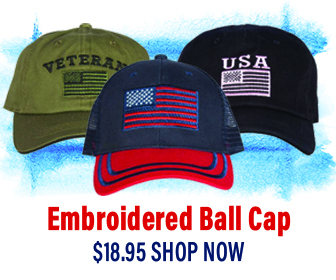 Attach commercial vents or hardware cloth to all other vents, too. If a vent nest is already in progress, wait until the birds fledge to remove the nest; then, quickly get a vent cover in place. 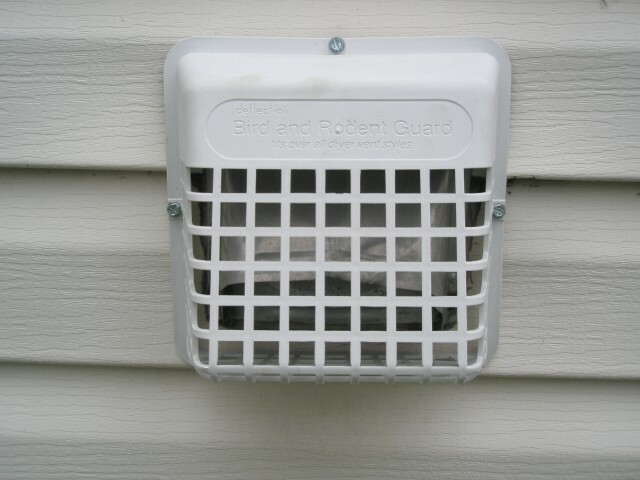 But, if the vent is needed for safety purposes, such as a dryer vent, you’ll have to remove the nest promptly. Carefully remove the eggs or young and place them in a makeshift nest, using as much of the original nest material as possible. Position the nest in a nearby tree, so the parents can continue their nesting duties. You might wonder what the complaint could be with house sparrows using nest boxes—after all, house sparrows are birds, too. True, but some prefer only native birds—such as bluebirds, titmice, chickadees, or Carolina wrens—to use the nest boxes they put out. The solution is to wait until migratory birds have arrived in your area before installing or opening nest boxes. 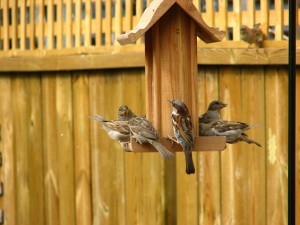 Otherwise, house sparrows—who are around all year—will claim the nest boxes first. Choose nest box designs meant for the species you prefer and place them in the most appropriate habitat for that species. The farther from your home the better, preferably 300 feet away—again, house sparrows prefer to live closer to us. If you prefer not to have house sparrows visit your birdfeeders, choose seeds they tend not to like. Many people are fine with house sparrows sharing in the bounty of the birdseed they offer, but if you prefer to feed only native species, choose your seed carefully. Avoid offering house sparrow favorites, such as millet, milo, wheat, cracked corn, and seed mixes containing these. An ideal choice is black oil sunflower seed or safflower seed—many native songbirds love both, and house sparrows show far less interest in it. House sparrows adore our outdoor cafes and picnic sites. Whether we are merely careless with crumbs, offer food on purpose, or fail to clean up quickly and thoroughly, we tend to leave lots of food that house sparrows happily swoop in to eat. Whether this is a service to be appreciated or a problem of some sort depends upon your perspective, but if you want to minimize their presence in these settings, the simple solution is cleaning things up quickly and often. House sparrows delight in entering stores that have loading docks or electric doors, as well as shopping malls, where doors open frequently. They know there is bound to be food inside and quickly learn how to come and go as they please. Installing strip curtains on loading docks will allow people to pass through, while keeping house sparrows out. When house sparrows get in through other entrances, you’ll most likely need to use nets or live traps to capture them, and then release them outside. To reduce the need for repeat capturing, take a look at the food and shelter opportunities for house sparrows in and around the building, and minimize those. With less food and shelter near your building, your house sparrows will soon search for a more appealing place to enter. Hey Buddy!, I found this information for you: "How to Get Rid of Sparrows". Here is the website link: https://effectivewildlifesolutions.com/get-rid-of-sparrows/. Thank you.